Once the hunt is over and you have harvested your trophy wild turkey, you will need to decide how it should be displayed in your home for years to come. There are many choices available to suit different space requirements or any budget, but the first thing to consider is the quality of your specimen. If your bird has a great deal of damage to any specific area, you will want to minimize the problem by choosing a pose which hides the damaged area. For instance, if one wing is in really bad shape, you could choose a side view gobbling pose which would conceal the damage on the bad side. If the tail was all messed up, you would probably not want to display it in a full fan, so a strutting pose would be a poor choice. However, if the head is damaged beyond repair, don’t worry about it. A damaged head should not be a problem, as taxidermists routinely use an artificial replacement turkey head instead of the real thing. Choosing a pose is one of the most important decisions you will make. 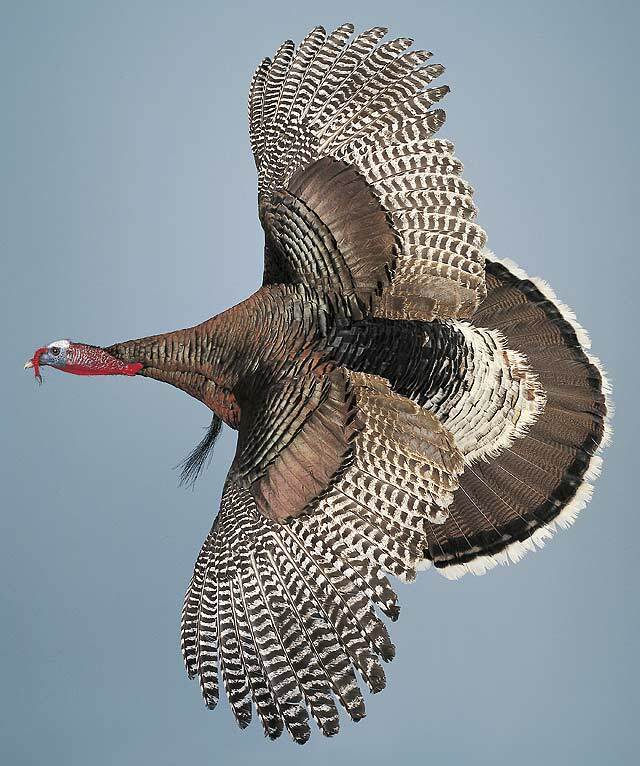 The basic poses that most turkeys are mounted in can be divided into five categories: strutting, standing (or walking), gobbling (or roosting), flying, and dead mounts. 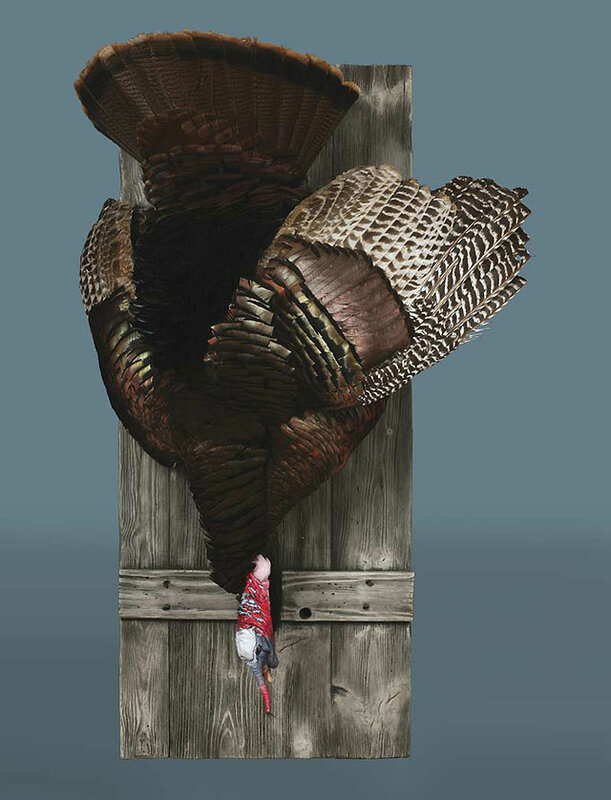 It is easy to underestimate the amount of room you will need to properly display a wild turkey. These birds can take up quite a bit of room. Strutting and standing mounts will need the most floor space or table space, while roosting, gobbling, flying and dead mounts are generally hung on the wall. Once you have determined the pose, the next step is to decide how you will display your trophy. Selecting the right base and habitat display is just as important as choosing a pose, as this decision will be the key to establishing the overall visual impact of your trophy. Incorporating a tasteful and artistic base in your display will help to complete the mount, by adding design, color, texture and storytelling to the piece. This added dimension will bring your mount to another level. Instead of just a mounted bird on display, you will now have a finished work of original art to complement your decor. The most beautiful and majestic pose is undoubtedly the strut. A strutting Tom displays all of his feathers puffed out for the optimum effect in impressing his hen. If you have a prime specimen with nice feathers, tail and wings, choosing a strutting pose is a no-brainer. This “shingling” layered display of all of the feather groups makes the iridescent colors of the feathers really pop for a stunning display. A strutting turkey will need to be displayed upon a base, which can be as simple or artistic as you desire. For woodland and forest scenes, you can customize the habitat display to reflect the scenery and vegetation that was present when you harvested your bird. In recent years, the artistic habitat has evolved into an integral part of the taxidermy display. The base in the scene above includes artificial rocks, driftwood, earth, moss, mushrooms and leaves in a polished wooden oval to create an impressive naturalistic work of art. To further break down the poses within the strutting category, you can choose from the full strut (the most popular pose), a three-quarter strut, or a half-strut. 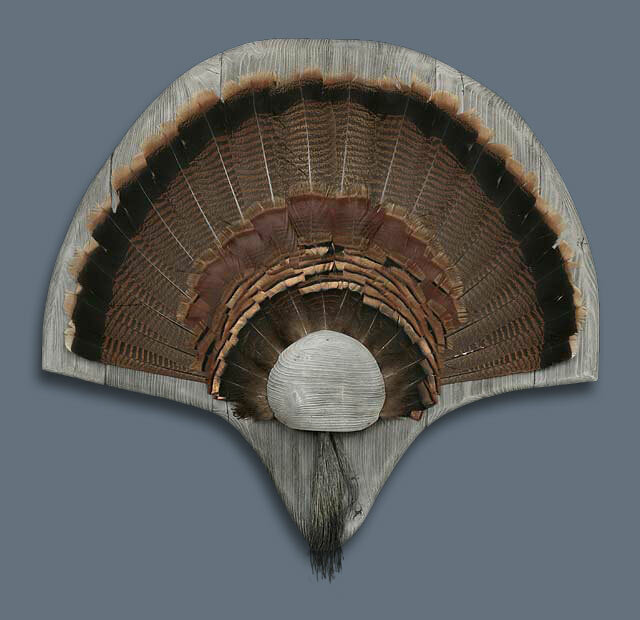 If floor space is at a minimum, but you still want the impact of a strutting mount on a natural base, there are some new forest floor habitat bases which are designed for wall hanging, so today it is possible to have a strutting turkey display in an artistic wall mount. The habitat base pictured above actually hangs on a wall, so no floor space is necessary. This also brings the bird up to eye level, which can help make a greater visual impact. Another alternative for a strutting pose with limited available floor space would be a simple, small base, just large enough to adequately anchor the mount. This three-quarter strut pose is mounted on an artificial stump base. A walking or standing pose makes an excellent choice for a full size mount if space is at a minimum, or if there is extensive damage to the wings or tail. This pose is also ideal for hens. 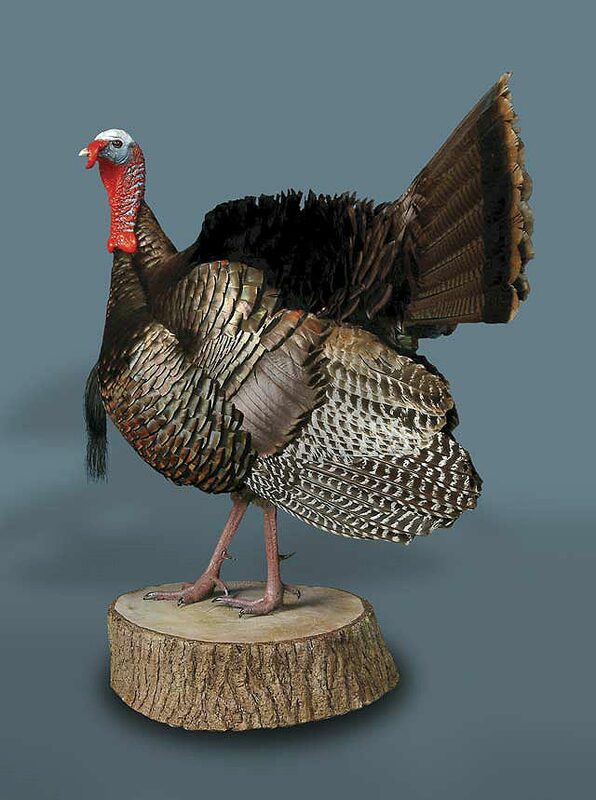 Gobbling or roosting poses are ideal for emphasizing a large beard and impressive spurs. 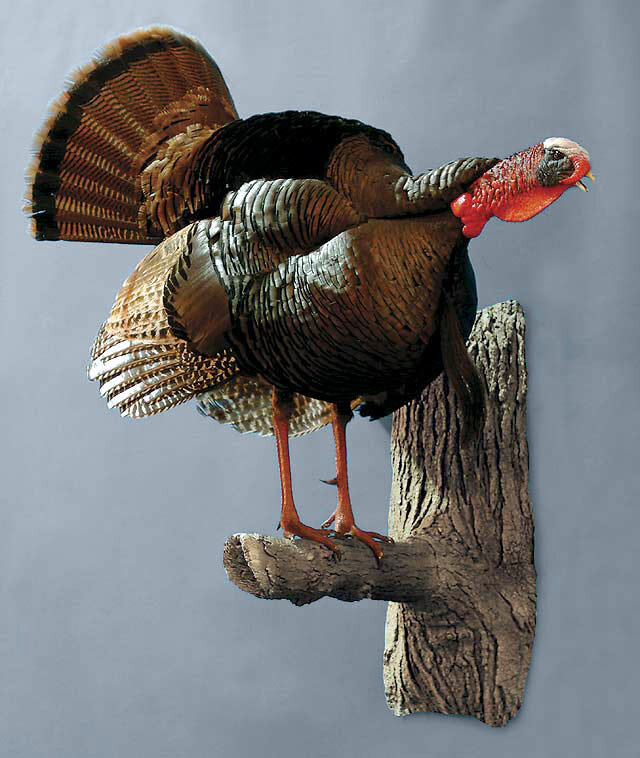 Mounted on an artificial limb, this pose makes an ideal wall hanger. For a large wall space, a flying pose makes an impressive display. A flying pose may be mounted without any panel as shown above, or it can be mounted with a finished wood panel or an artificial bark slab. Make sure that you have enough ceiling height to properly display a flying pose, as they can take up a lot of real estate on the wall. A hanging dead mount is reminiscent of the great painting masters of the 19th century who immortalized the aftermath of the hunt with their trompe l’oeil works of art. The mount above incorporates an artificial barnwood panel for a rustic feel. A dead mount is also ideal for including artifacts such as shotgun shells, turkey calls and hunting accessories right in the display to personalize your trophy and commemorate your special hunting experience. 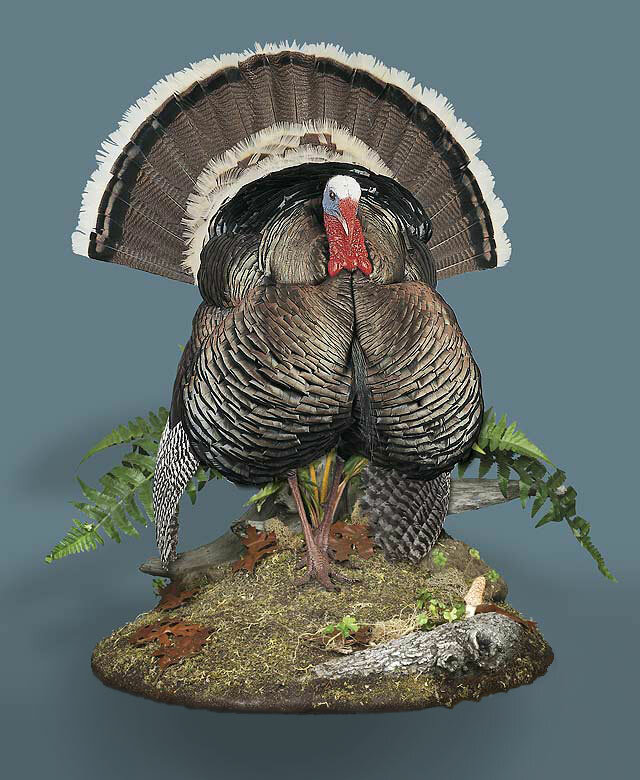 If space and/or finances are at a minimum, you can still have a trophy display featuring the fanned tail and beard of your wild turkey. The cost to produce this wall hanging arrangement is a fraction of a full-size mount. This would also be a good choice if the body or wings were damaged beyond repair. 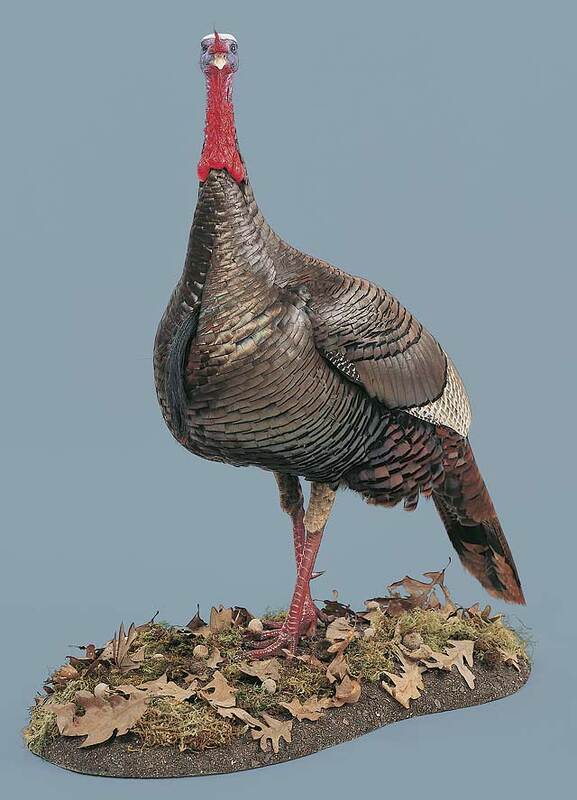 Whatever you decide, your turkey taxidermy display will be a permanent reminder of your successful spring hunt, bringing a tasteful slice of the outdoors into your home as a treasured memory of sports afield. 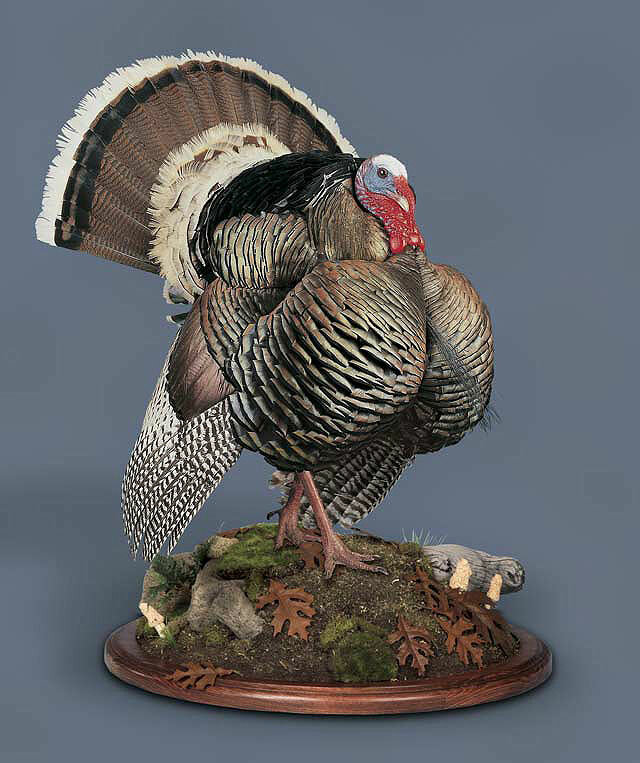 Be prepared before the hunt to ensure that your turkey specimen will produce the very best quality mount. See this article to find out everything you need to know about Wild Turkey Field Care.